Portoni della Bra is one of the main entrances into the town of Verona. As soon as you step through it into Piazza Bra you are whisked back in time to the Roman era. In front of you is a Roman amphitheatre, the Arena. When Augustus built this amphitheatre two thousand years ago it was outside the city walls. Now it is in the centre of the town. Originally surrounded by two walls the outer wall was destroyed by an earthquake and only a small part of it, the Ala (wing) remains. 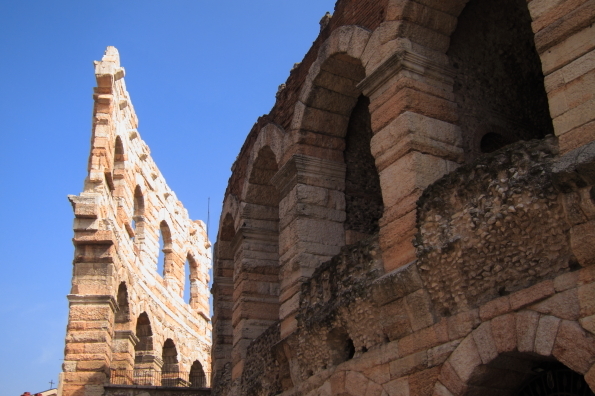 This amphitheatre is the third largest Roman amphitheatre remaining in Italy and the best preserved. It is a wonderful venue for the annual summer opera season in Verona. Piazza Bra derives its name from braida which in Veronese means ‘large open space’. Originally covered with sand in 1782 the piazza was paved with small granite cobblestones in different colours ranging from shades of grey to blue, red and green tints. In those days it was known as the Listrone. Then and now it is the most popular place for an evening stroll. Leaving this piazza I followed the famous shopping street Via Mazzini until it emerged in Piazza delle Erbe that was once the Roman Forum. Just beyond this large piazza are the remains of another Roman gate, Porta Leoni. This gate has been incorporated into more modern buildings and was christened the Gate of Lions when excavations revealed a tomb decorated with two lions. It was not just a gate but part of a larger structure that included two towers and barracks for the soldiers. The remains of this structure have been exposed to public view. 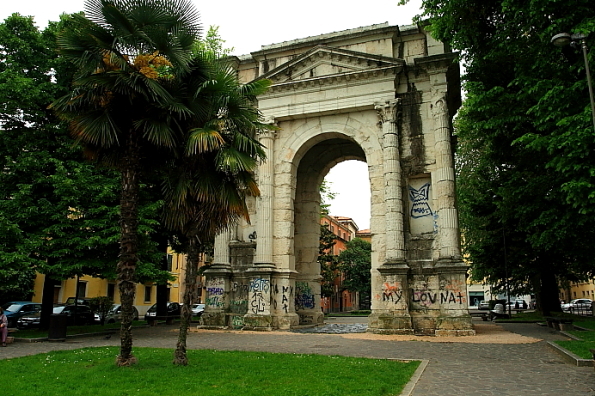 All that remains of another Roman gate, Porta Borsari, is the façade that arches over another entrance to the old city. 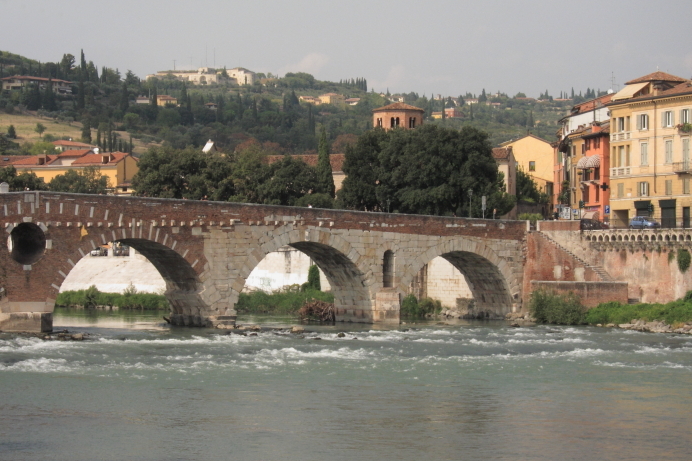 I crossed the River Adige that encircles the city on the one remaining Roman bridge, Ponte Pietra (Stone Bridge). This bridge was built during the construction of the Postumia Road that linked Genova and Aquileia. It has been damaged and re-built on more than one occasion but still proudly spans the river. On the far side of the river is the Teatro Romano (Roman Theatre) which is older than the Arena and is still used to stage events such as ballets and concerts. Elevated above the bank of the river it is a delightful venue with views over the city. The theatre is also the site of a very important archaeological museum. 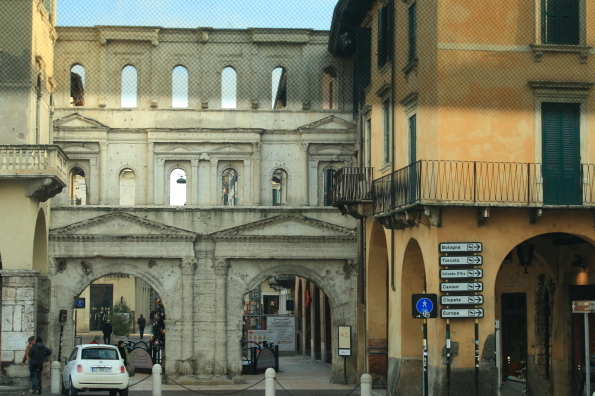 One may wonder why the only remaining Roman arch in Verona, Arco dei Gavi, is situated beside the road rather than over it. This rare example of an arch dedicated to a family impeded the advance of French troops when Napoleon invaded the city in 1795 so it was dismantled. The locals collected the stones and in the 1932 the arch was re-constructed on the bank of the Adige, close to the road it once spanned. 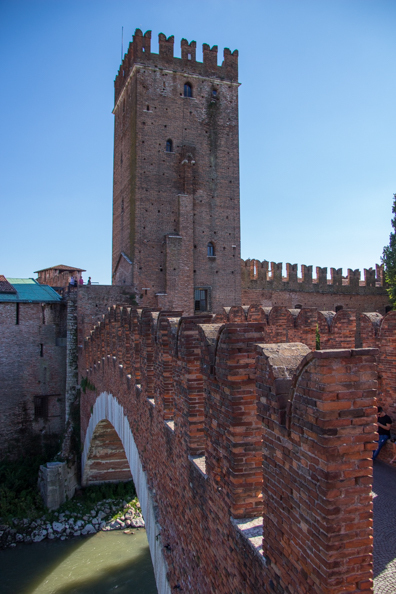 Arco dei Gavi is next door to the Castelvecchio and stepping from one to the other is another journey across the centuries, into the Medieval Verona. 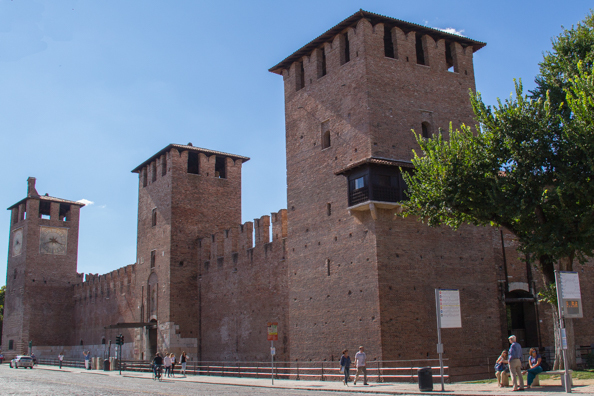 The Castelvecchio whose reddish bricks and swallow-tailed battlements are typical of Gothic architecture was built between 1354 and 1376 by Can Grande II. Cangrande II was the penultimate member of the della Scala family, also known as the Scaglieri, to rule Verona. This family rose out of the muddied history that followed the collapse of the Roman Empire. Their reign began in 1259 when Mastino della Scala was elected the captain of the citizens of Verona. When the citizens refused to re-elected him he took the position by force and the Scaglieri ruled the city for a century. For Verona it was a period of stability and growth. In particular Cangrande I the most famous head of the family, brought peace and prosperity to Verona. He loved his city and its people loved him. 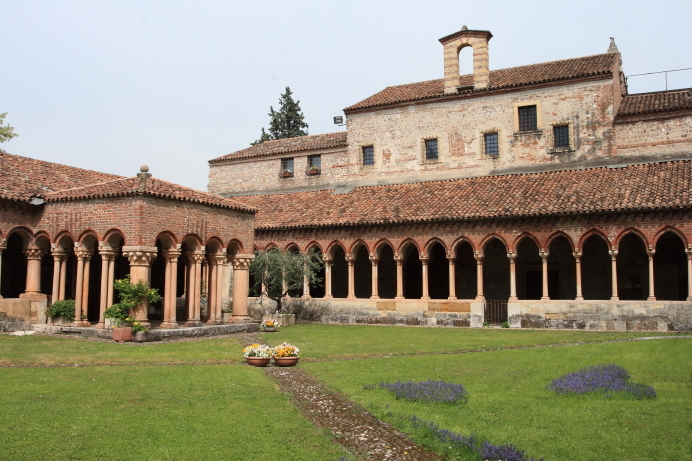 During his rule Dante and Giotto stayed in Verona. When he died he was buried in the family’s private cemetery. 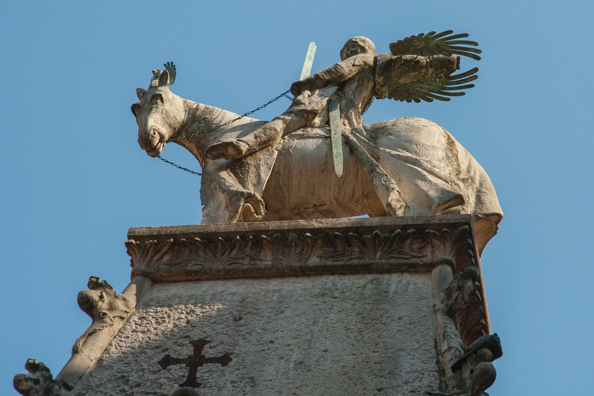 His equestrian statue, celebrating his military success, was erected in this small cemetery but was replaced by a replica when the original was moved to the museum in Castelvecchio. 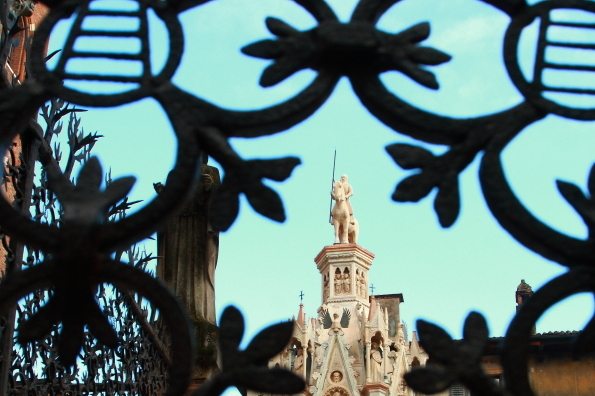 This private cemetery contains the tombs of the most important members of the della Scala family. The impressive tombs or arche of Cangrande I, Mastino II and Cansignorio are considered to be the most beautiful examples of gothic art in Italy. The design of railings around the cemetery incorporates ladders (scala) which was the symbol of the family as well as the dog (cane in Italian). Dogs are replicated in sculptures on the front of the tomb of Cangrande. This tomb is above the entrance to the small private church of the della Scala family – the church of Santa Maria Antica. This church was built long before the family began to use its courtyard as a cemetery. Cangrande I (christened Can Francesco della Scala) ruled Verona between1291 and 1329. He was a successful warrior and took control of several neighbouring cities, in particular Vicenza, Padova and Treviso. He was also the leader of the Ghibellines in Northern Italy. Fierce rivalry had developed between the Ghibellines who supported the Holy Roman Emperors and the Guelphs who supported the Pope. This rivalry caused conflict between neighbouring cities and divisions within families. The Ghibellines were identified by the swallow tailed turrets on their buildings. Mastino II was one of the most ferocious members of the della Scala family. His equestrian statue portrays him as arrogant and contemptuous. He became the richest and most powerful prince of his generation in Italy and continued his uncle’s policy by conquering Brescia in 1332 and carrying his power beyond the Po. He bought Parma in 1335 and Lucca in 1339 but then a powerful league was formed against him and after three years of war his domain was reduced to Verona and Vicenza. When he died this unpopular tyrant was succeeded by his son Cangrande II. Nicknamed Can Rabbioso (Raging Dog) he ruled Verona with an iron fist, amassing rich treasures for his illegitimate sons and impoverishing the city. This caused internal strife which led the suspicious Cangrande II to surround himself with Brandenburg mercenaries and to build a fortified castle to protect himself from enemies within and outside the city. 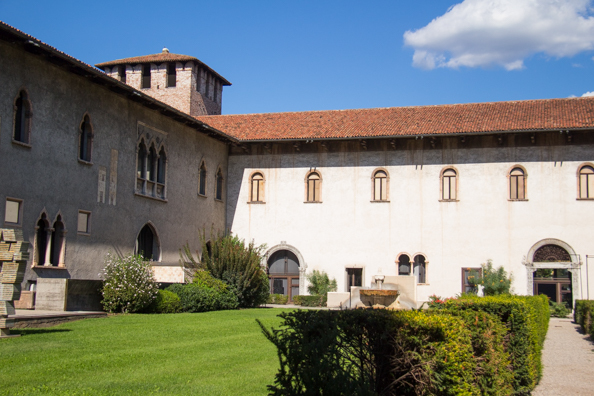 This splendid castle did not protect Cangrande II from assassination by his own brother, Cansignorio who was the last of the della Scala family to rule Verona. He devoted himself to the embellishment of the city with aqueducts and bridges and the fountain of Madonna Verona which today is a symbol of the city. By then Verona was in a decline and when it was captured in 1387 by the Visconti who had acquired rights of succession to the city by virtue of marriage Cansignorio fled the city. He probably used the fortified bridge, Ponte Scaligeri (Scaligeri Bridge), at the back of the castle. This had been incorporated into the castle as an escape route for the family should the city ever rise against them. The castle itself was divided into three parts. Two thirds were occupied by the family’s army and the other third was residential although it is not clear if it was a permanent place of residence for the family or a place of safety during invasions or local uprisings. The castle has a moat (now dry) and a drawbridge. It was restored in the nineteen fifties using modern materials and it now houses a museum. This museum was designed by Carlo Scarpa. This Italian architect became well known for his ability to integrate historic features with modern concepts. Another famous monument of Verona that was built during this period is its cathedral. Originally built during the sixth century it was rebuilt during the twelfth century after it was destroyed by an earthquake. The façade, in Verona marble, features bas reliefs of both sacred and profane events. At the back of the building there are some lovely twelfth century cloisters with arcades on double colonnades. 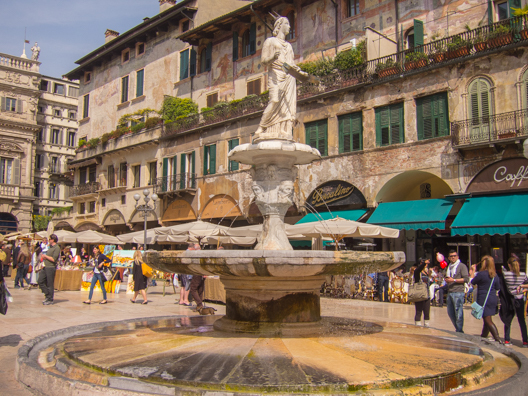 Verona’s most famous attraction also has its roots in this period and the rivalry between the Ghibellines and the Guelphs. This rivalry was reflected in the enmity between the Montecchi and Capuleti families that was the subject of Shakespeare’s famous play Romeo and Juliet. A house, built during the twelfth century, was owned for a long time by the Dal Cappello family and a popular theory developed that this was the home of Juliet the mythical heroine of this play. This house was restored between 1936 and 1940 with some additions – windows, a gothic-style doorway and the famous balcony (fashioned from an old tomb) were added to the façade overlooking a small courtyard. 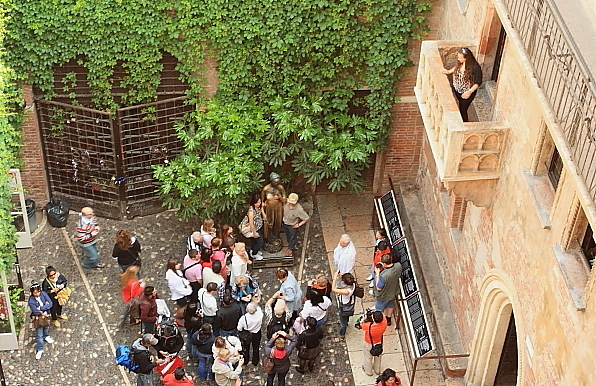 A bronze statue of Juliet by sculptor Nereo Costantini stands in the courtyard. A superstition has grown up that clutching her now very shiny left breast will bring good luck in love. Shakespeare himself never visited Verona – he should have, he missed a treat. Can’t wait to go there soon! I am sure you will love it when you do get there. Enjoy – and thanks for posting a comment.